Free printable Christmas gift tags is one of my most popular posts – so I thought I’d do another one, to give all you lovely internet people some more options. 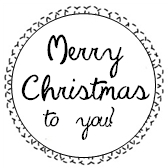 I made up some more free printable Christmas gift tags. Pretty, yes? There’s seven designs in total. I think they’d look great printed onto festive paper, with a note written on the back. Here’s the downloadable PDF, completely free for personal use. Enjoy! This entry was posted in Christmas, Free Printable, Gift Wrapping and tagged Christmas, Craft, Free Printable, Gift Wrapping. Bookmark the permalink.